Have you ever paused, found yourself staring at something and your brain is screaming, “This isn’t a good idea.”? That something could be the “send” button on that email to your boss; that last shot of tequila; the pool below the balcony you’re on; or that 16 year old checker girl at the local grocery store. All logic tells you, that something should be left alone, but do you think the Fonz considered the consequences of ski-jumping a shark? Sorry, I was staring at something. Where was I? Of course not, the Fonz jumped the shark because he’s The Fonz. Sure, he probably couldn’t swim wearing that leather jacket, and being a transplanted New York Italian Jew from Wisconsin that hung out with nerdy redheads, he likely had no idea how sharp that shark’s teeth really were. Although, they couldn’t have been sharper than Leather Tuscadero, but nevertheless, the Fonz jumped. He jumped because, um, because, well, I don’t remember that episode too well, but he jumped the shark. Hence a phrase was born that will forever live in infamy to describe those who have gone from being The Fonz to that guy who was Chachi’s Uncle. Ladies (who am I kidding?) and Gentlemen, I present my shark jumping moment. As described in a previous post, I’ve been sitting on these custom cards for over two years. These were intended for Thorzul’s Nightmares on Cardboard Contest, but like certain things in my life, I prematurely made them and subsequently disqualified myself from the contest two years running. Beat that. And inside we find the first Terror Card, a gem mint Father Merrin. Father Merrin was the Trevor Hoffman of the Washington Padres. His save record was spotless until his first (and last) blown save that drizzly, pea soup laden Georgetown night. Prior to being called up to the Savior Circuit, Father Merrin spent considerable time in the African Pazuzu League. Coming into his final game, Father Merrin was sporting a Eucharist Receiving Average of 1.45 with an unheard of Communion to Confession ratio of 2.37. 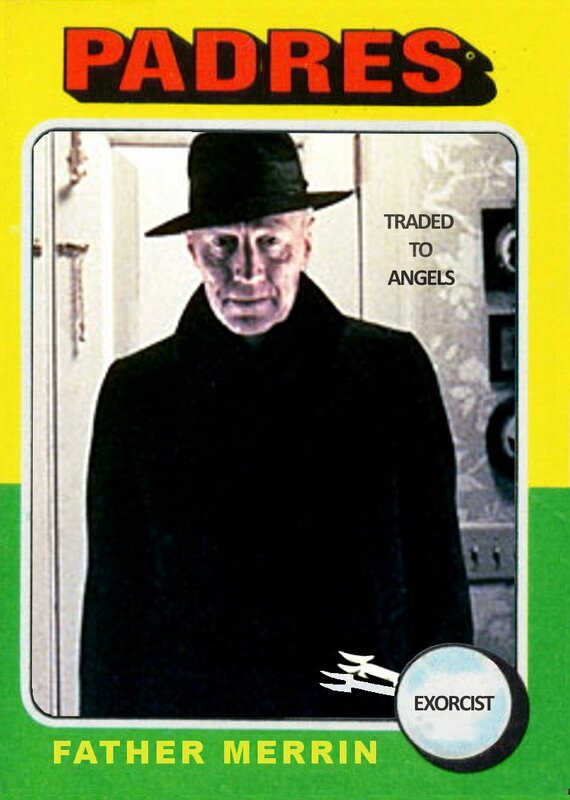 In his last save attempt, Father Merrin suffered a heart attack and was replaced by Father Karras. Immediately following the game, the Padres traded Merrin to the Angels. Let’s flip the card over. 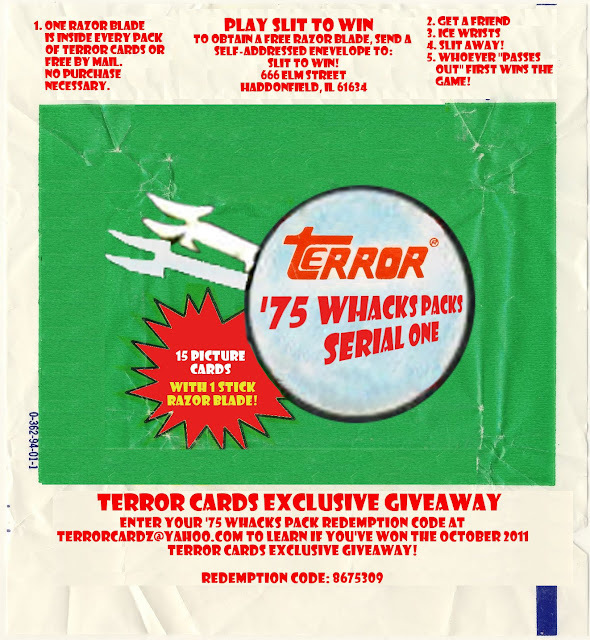 Oh, I sense an homage to 1970s movie/TV show cards!